Leah Warshawski did not come upon her career in what might be called a conventional sense: Instead, she stumbled into filmmaking while studying in Hawaii while translating Japanese for tourists on a boat. “I never thought I’d make films or want to make films, but loved working outside,” says Warshawski, who had been studying Japanese. But when one of her passengers, a marine coordinator for the television show “Baywatch,” needed an assistant, Warshawski’s career turned to work on commercials, feature films, and television shows such as “Lost” and “Survivor: Fiji. As the years went on, however, she became more interested in documentary work. Today, “about 75 percent of what I do is writing documentaries and telling stories,” she says. 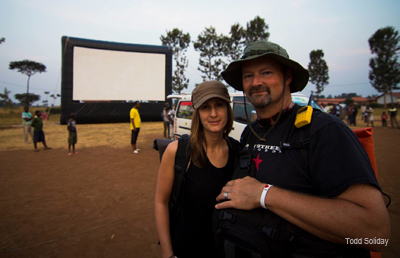 That transition led Warshawski to create projects like “Finding Hillywood,” which documented Rwanda’s film industry, dubbed “Hillywood” in reference to the country’s hilly countryside. During the crew’s first trip, in 2007, they decided to tell the triumphant story of a country, healing from the horrors of genocide 15 years earlier, whose recovery was brought about in part through filmmaking. “Back then we didn’t realize that the film would be what it has become,” Warshawski says. “Finding Hillywood” brought her in touch with the Seattle-based Washington State Holocaust Education Center. A partnership with the center made sense, given the concept of a country that reinvented itself after such a tragic time in its history. On her current documentary project, “Big Sonia,” Warshawski captures the personal story of her grandmother, 88-year-old Sonia Warshawski, one of the last remaining Holocaust survivors in Kansas City. From an educational perspective, Kennedy and the Holocaust Center could not be more pleased about that film’s eventual release. “I love that it will not be a traditional Holocaust film, but will tell the story of her grandmother in both a sensitive and humorous way,” says Kennedy. In her effort to partner with organizations that can benefit from the educational component of the films, Warshawski aims to tell the stories of triumph from tragedy. Her stories echo what has concerned the Jewish community in recent years: Fewer and fewer Holocaust survivors remain to tell their stories. Capturing Sonia’s story on film now encapsulates her legacy for future generations. To find out more about Leah Warshawski’s projects, visit inflatablefilm.com.